LAKEWOOD, Colo. – Oxi Fresh Carpet Cleaning, an oxygen-powered carpet cleaner that serves customers across the United States and Canada, announced the launch of a new location. This Atlanta carpet cleaning franchise, led by Andrea Woods and Andre Phinnessee, is proud to serve the Cobb, Fulton, and Dekalb County areas. 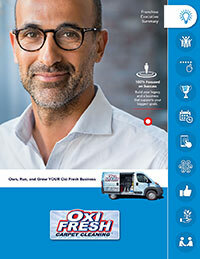 “Oxi Fresh offers customers something unique,” said Mr. Barnett, “quality results combined with convenience and top-notch customer service. It’s the full package, and it’s what customers deserve. I know that the new carpet cleaning team in Atlanta will really ‘WOW’ customers with their results. Mr. Phinnessee and Ms. Wood’s customers can count on them to provide truly world-class service. This team met at the University of Tennessee, where they both demonstrated a great interest in entrepreneurship. This shared vision led them to launch a business together. Of course, this isn’t their first foray into the world of business. Andrea has served as the vice-chair for the Douglas Health Futures Foundation, and she currently works in the banking world. Mr. Phinnessee works both as an industrial engineer and serves as the VP of Strategic Planning & Operations for the local non-profit MAFDET Inc. The team really looks forward to leveraging their business experience to ensure customers enjoy Oxi Fresh’s eco-friendly carpet cleanings. The company does pride itself on its eco-friendly processes. Their carpet cleanings use carpet solutions that were carefully designed to maximize both cleaning power and eco-friendliness. Their machines are also energy efficient, and they conserve a significant amount of water with every cleaning. Unlike traditional cleaners who need 40-60 gallons of water to clean an average home, Oxi Fresh needs two gallons of water. This significant reduction is estimated to have saved over 35,000,000 gallons of water since 2006. To schedule a carpet cleaning in Atlanta, click here or call (678) 365-3001. To learn more about Oxi Fresh Carpet Cleaning of Atlanta, go to this page: https://www.oxifresh.com/locations/ga/atlanta-carpet-cleaning.